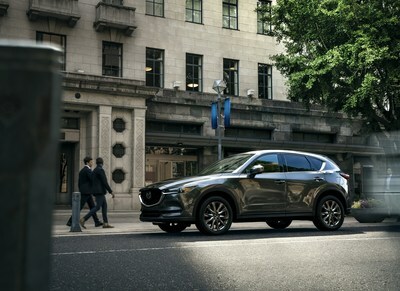 RICHMOND HILL, ON, Nov. 9, 2018 /CNW/ - As Mazda's best-selling vehicle, with over 2 million units sold worldwide, the compact crossover takes its next step with the unveil of the new 2019 Mazda CX-5 Signature top-tier trim level, which includes the turbocharged SKYACTIV-2.5T engine and new G-Vectoring Control Plus. The development team listened to customer wants when setting their goals for this update and strove to create an SUV that enlivens all who ride in it. They focused on improvements of a premium high-quality interior, refined powertrain and enhanced chassis. The new CX-5 Signature model incorporates premium materials, such as Cocoa Brown Nappa leather and Abachi wood trim, that are chosen with the closest attention to detail. Other features in the 2019 CX-5 that support comfort, convenience and safety include Apple CarPlayTM and Android AutoTM, a reconfigurable 7.0-TFT gauge display, heated and ventilated front seats, heated rear seats, heated steering wheel, BOSE® 10-speaker premium sound system, windshield-projected Active Driving Display head-up unit, power folding exterior mirrors, and a frameless rearview mirror with auto-dimming and Homelink® wireless control system, amongst others. Overall these updates help realize a feeling of a higher quality vehicle. The powertrain lineup adopts the SKYACTIV-2.5T direct-injection turbocharged gasoline engine that is also found in the Mazda CX-9 three-row crossover and Mazda6 sedan. This engine's strong torque helps provide a smooth ride with an effortless feeling of acceleration to create a refined and exhilarating driving experience. Additionally, refinements to the suspension system and addition of G-Vectoring Control Plus technology further embodies Mazda's Jinba Ittai - "horse and rider as one" - engineering philosophy in the 2019 CX-5. Improvements like this are what continue to help make the vehicle feel like an extension of the driver. More information regarding pricing and specifications for the 2019 Mazda CX-5 will be available at a later date.